This is a very healthy Indian style pudding made with brown rice and jaggery.We all know the health benefits of brown rice and jaggery. Brown Rice is rich in fiber and is a good source of manganese and selenium. Jaggery is rich in iron and is definitely a better choice than sugar.Today we will learn how to make jaggery brown rice payasam following this easy recipe. Ground brown rice coarsely like rava and soak in 1/4 cup of water for 1 hour. Cook brown rice till soft.You can pressure cook also. Dissolve jaggery in a little water and filter it to remove impurities. Chop the nuts and keep it aside. Combine milk and rice in a pan and cook on low flame till milk reduces a little, stirring from time to time. Add jaggery, cardamom powder and mix well. Switch off the flame and garnish with roasted chopped nuts. It can be served either warm or cold. Note - It will thicken as it cools, if needed you can add a little milk according to the consistency needed. Meet you with more interesting recipes. 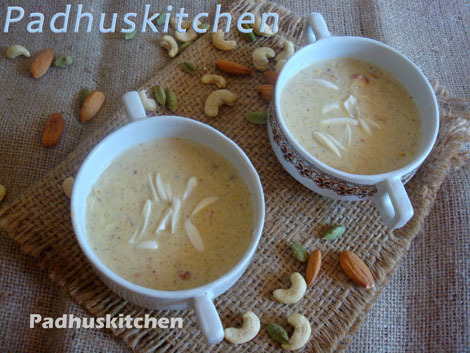 A very delicious and healthy version of kheer.love to try this. Healthy kheer..love the jaggery payasams. This payasam is new to me.Bookmarked.Very tempting. kheer looks delicious. I never made using brown rice. I ll try some time. i haven't tried kheer made of brown rice.. this one is inviting.. So healthy and appealing kheer !! Thanks for the Brown Rice Pudding Recipe recipe. If you don't mind, can you submit your Brown Rice Pudding Recipe photo in http://www.foodporn.net ? Healthy and super delicious payasam. yummy recipes...Thank you for your comment in my space,,happy to follow u..keep visiting my space.. Yummm!! Padhu am drooling here I love Kheer and yours looks mouthwatering..
Congratulations on your Liebster award from Preeti @ Indian Kitchen. Well done! This looks really healthy and delicious. I have become a big fan of ur recipes and just luv the way you present it.